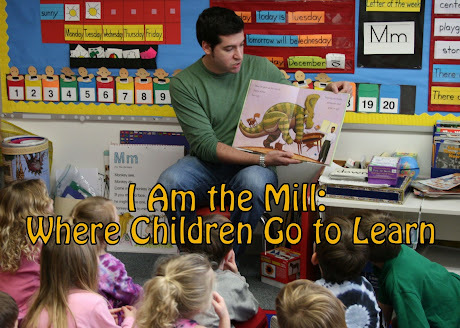 I Am The Mill: OMG!!!!! Robosaurus For Sale!!!!!!! Don't worry about how I came across this link: www.robosaurus4sale.com. Let's just say I've been waiting for this to happen for quite some time - ever since I first wondered aloud, "Why can't I buy a giant robot monster who can breathe fire and eat cars?" And if you're not immediately familiar with Robosaurus's massive body of work, please see the photos below. The driver of this car survived...just barely. Robosaurus is nearly impossible to control, but perfect for Bar/Bat Mitzvahs and Sweet Sixteens. A near-mint 1977 Ford Pinto is rendered even less reliable by Robosaurus. 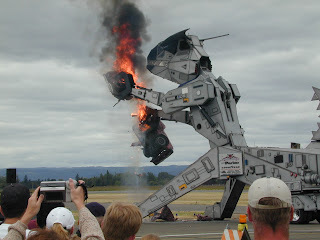 You may recognize Robosaurus from a recent Toyota commercial in which he breaks his mouth on a pickup truck. Also, if you attend a lot of NASCAR events, airshows, or state fairs, you may have seen him perform live. I envy you if this is the case....but not for long. That's right, I'm going to buy Robosaurus. Or at least put in a bid. It's difficult to ascertain the value of a giant car-eating robot, that also transforms into a trailer for easy transport from venue to fantastically entertaining venue. In any case, he was built in 1990, weighs 58,000 pounds and has 20,000 pounds of car/animal/man crushing force in his hydraulically-powered metal jaws. So what do you think? $5k? $7k? 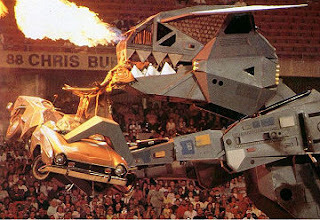 I bet I could easily get a bank loan for Robosaurus - the resale value should be very high, because 1) basically everyone secretly wants one of these things, and 2) I plan on making a number of upgrades, including GPS navigation, LOJACK, chrome exhaust, and a snowboard rack. All of this comes at the perfect time. My 10-year college reunion is coming up next summer, and I've been racking my brain for something with which to really wow my former classmates. I'd like to enter the reunion with a bang, literally. Yeah, I could probably bring a really cute dog, or a few adorable babies with me. Or rent a Ferrari for the day. I've even looked into solving the logistical perplexities of parachuting out of a helicopter while riding a giraffe, and landing on a rhinoceros that's patiently waiting on the ground while standing on four skateboards. The real problem is that the skateboards need to be specially reinforced to support the rhino's weight. It's a difficult problem to solve, and I don't have the time or engineering know-how to make sure I get it right the first time. Alternatively, I could just buy Robosaurus, bring him to the middle of campus, and start chowing down on all the cars in the area. Breathing fire everywhere. People screaming. Children laughing. Police pursuing. National Guard mobilizing. And then I'd step out of the cockpit (I'm not actually sure that there is a cockpit), onto Robosaurus's head. Fist raised triumphantly, holding a megaphone to my mouth, "Hello Class of '98!! It's been 10 years, and the only thing that's changed is I now own this huge car-eating robot!! Let's party!" And my classmates would see me, and congratulate me for my incredible entrance. Then we'd head to the open bar and get smashed. The keys to Robosaurus would get passed around later that night, and I'm assuming the night would end in some sort of tragedy. No matter the casualties, it would be an occasion to remember.